The dream stayed with me the rest of the day, and I thought it was probably inspired by a little Guild watching, or Dr. Horrible, or just all the talk about her YouTube Channel, Geek & Sundry. On April 1st, Felicia did a subscribe-a-thon to get people to subscribe to the YouTube channel launching the next day. She would stay “on air” all day, interacting with people, interviewing nerdy types, and roping her friends in to do things like perform a fan-sourced short play. Occasional filler time between major, scheduled segments was taken up with things like asking Twitter what the weirdest food people actually eat is. Now, Twitter is Twitter, and most things said are lost in a vacuum forever. I thought maybe I’d get a “ha ha” in reply from the G&S feed. I didn’t know why they were asking: Maybe Felicia would read a list of weird foods on the air and I’d get a little Twitter shout out if mine was one of them. I like stuff like that; I’m not proud. The subscribe-a-thon was a Google+ Hangout. I brought my laptop outside to do my best Clara “Ignoring My Kids is Good for Them” Beane impression and sneak some quiet space for a minute. Then I clicked the link and freaked right the hell out because I realized I was about to have a very public conversation with a nerdy icon. If I’ve ever convinced you that I’m out-going or good with people, ha ha. Joke’s on you. I’m good online, typing words. I’m not good in person. But this Google+ hangout was going to be fairly “in person”, and I couldn’t hide behind my keyboard. I was the first one in the hangout with Felicia, (there were other entries in the Weird Food contest that I didn’t know I had entered, and they weren’t as quick on the click as I was) so we talked for an hour or so (or 30 seconds…time bent) and then we got down to the point of the hangout. This is not a screen-grab from our hangout, since I had zero presence of mind to think to do that. This is from, uh, some other time I took a picture of her while she was on one of my screens. It’s not weird. Shut up. 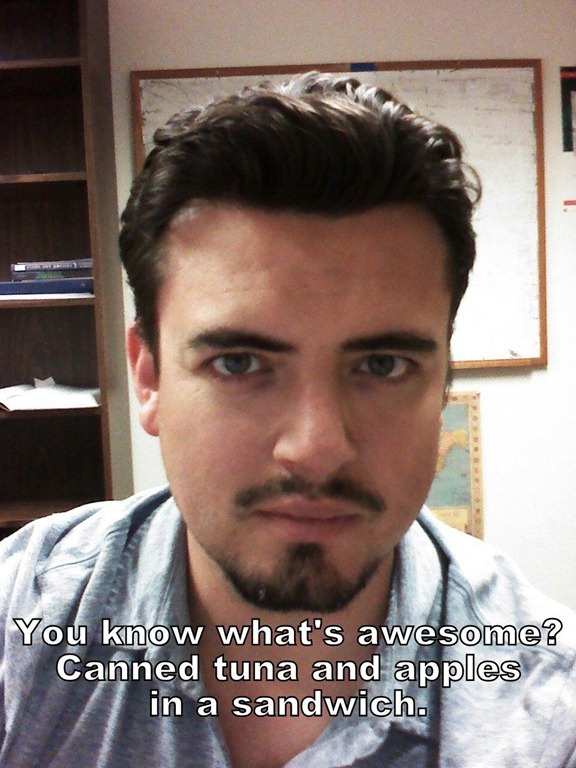 What she actually said was that she liked tuna and apples too, and that she thought it was a ladies-who-lunch thing. I always thought it was a “get fruit into the poor kids somehow” thing. But I’m not from the South. Maybe things are different there. As it turns out, I was not the person who liked the weirdest food. I never expected to be; all of this was a delight and a surprise. But in the end, as one of the participants I was offered a DVD of one of the seasons of The Guild, and I bowed out of the conversation because as much as, to me, that moment was all about me, it totally wasn’t about me and I was just trying to keep the cool lid on the boiling pot of nerdy crazy that was threatening to bubble out. 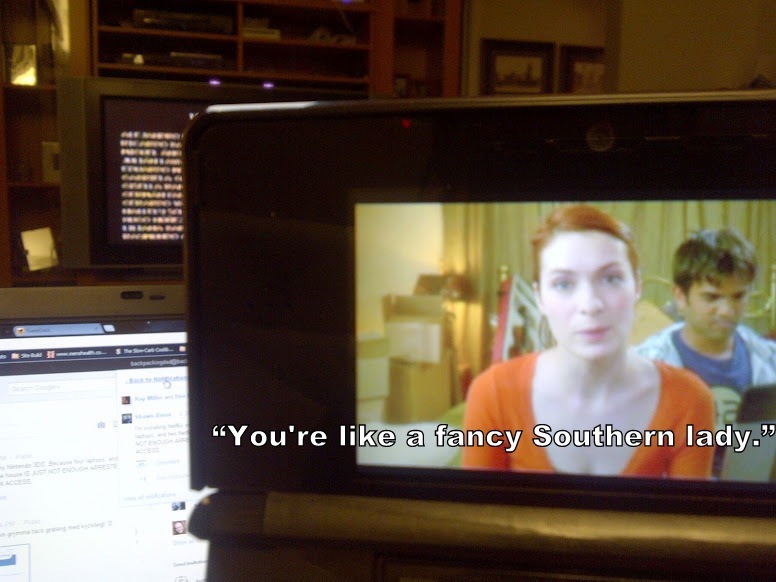 I followed the rest of the subscribe-a-thon, and I’ve been watching some of the shows on Geek & Sundry. I like geeky things, and I always have, but that personal moment probably cemented things for me. I’m a fan. 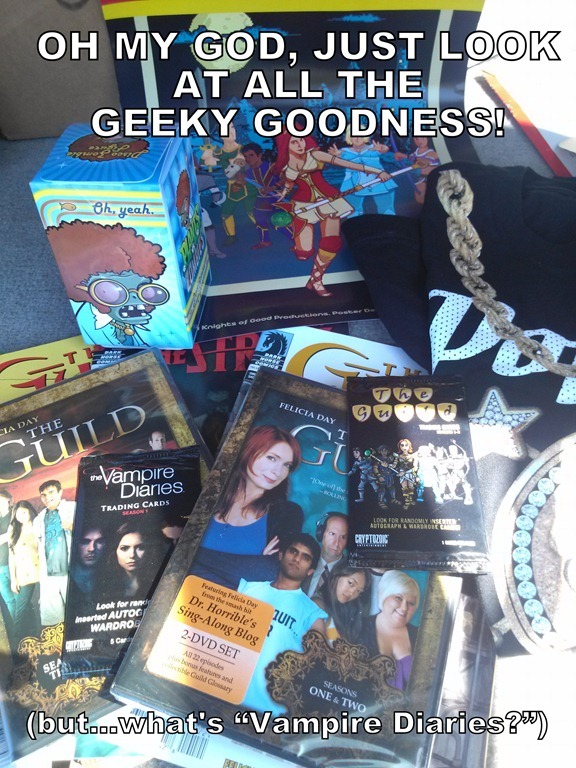 About a week later I checked my mailbox, and inside was a box from Geek & Sundry. Season 5 of The Guild? Oh, so much more than that. It was a box of DVDs and posters and comic books and a t-shirt…it was like I stole someone’s Comic-Con swag bag. I was sure someone had made a mistake. Nope: Geek & Sundry is just awesome like that. I get free things sent to me sometimes because I’m a blogger and companies seem to think that matters. But this was different. I don’t think my being a blogger had anything to do with that box. It was just Geek & Sundry, going all “WHEE!!!! !” about life. I’d better get an invitation to Ryan’s wedding. When I initially clicked on the link, I intended to either make fun of you for following my SEO advice about using the words “Felicia Day” and “naked” on the same webpage. Or make fun of you for not doing so. Whatever. But this, this is just awesome. I wish I liked weird food, and was timely with it. Also, I think this comment fixes your SEO problem. So, yeah. I had forgotten your advice! Damn. Great post, I believe people eat some really strange things. I personally have eaten rattlesnake, beaver, squirrel, rabbit, and bugs. I am somewhat the outdoorsman type haha.